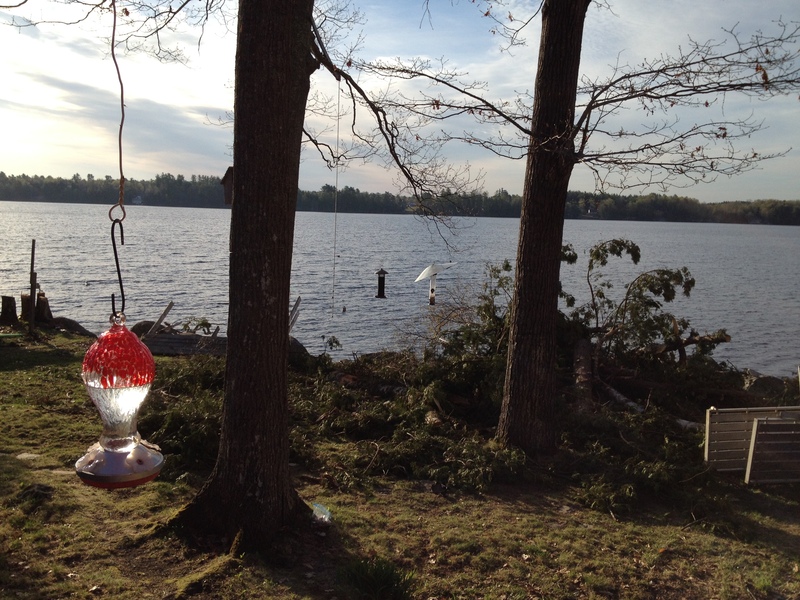 The Humming Bird Feeder is found! We’ve been settling in and getting the ground work done so that when the time is right (and the conditions are right) the demolition of the existing house can happen. It will likely be sometime during the week of the eighteenth. The electric company came out today to inspect the new power line set-up that our electrician put in and it’s a go. They’ll all be here on Friday to do their thing. We are having the electric in the guest house upgraded so it will be to code and we can run a space heater and a hair dryer without the fear of popping the circuits or, worse, having a fire. The last time anybody actually lived in this guest house was in the mid-to-late 70s before personal computers or all the personal electronic stuff that we now “need”. It needs to be upgraded and safe! This little cabin is a lovely place to sit and relax and enjoy the birds and the lake. We’ve got the humming bird feeder filled up and the humming birds have found it. We watched a hummer flying in an upside down arc over the tree branches in the yard today. I’ve never seen anything like it. That little bird flew back and forth about a dozen times. It was marvelous to watch. My sister-in-love and brother and their three boys gave me a beautiful potted plant for mothers day and Ned hung it on the corner of the guest house so we can enjoy it. Planted flowers make it feel like home! Ned bought me a beautiful forsythia bush that we’ll plant within sight of the kitchen window so that when spring comes next year, I’ll be able to enjoy it and remember. Ned has begun to take out the windows that we want to salvage and before we know it, it’s going to be time to have the propane tank moved. That will be the end of our cooking in the old house … and the end of the house, as it was. We both find ourselves feeling very, very sad about the old house being demolished but we still look forward to seeing the new house going up in its place. This entry was posted in Uncategorized and tagged a special place, fishing cottage lake house, Guest House, lake house, Living in Maine, Maine, Messalonskee, Messalonskee Chronicles on May 12, 2015 by lindarockwell3.